Barely four days after former Vice President Atiku Abubakar publicly declared his intention to contest for the 2015 presidency on the platform of the All Progressives Congress (APC), another leading figure in the party and former Head of State, General Muhammadu Buhari (retired), has also fixed October 8 for his declaration. However, Abdulmumini Jibrin (APC Kano) in the House of Representatives yesterday warned that taking cue from a statement credited to Buhari in 2011, that he would not contest any elective position again. THISDAY gathered from a reliable source that the former Head of State and his supporters have drawn up an elaborate programme for the launch of his presidential bid which would begin with the public presentation at the Eagle Square, Abuja on October 8. 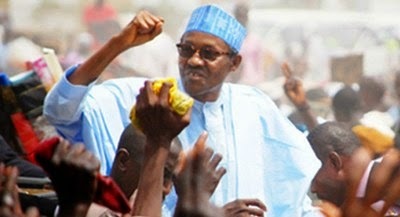 The plan for Buhari's formal declaration for presidency came on the heels of the approval of the time table for party primaries and fee for nomination forms by APC's National Executive Committee (NEC). forms for the presidential and governorship tickets at N25 million and N10 million respectively. Also yesterday, the party expressed deep concern over the eruption of violence in Ekiti State which resulted in an attack on a Judge and demanded for the immediate arrest and prosecution of the Governor-elect Ayodele Fayose. While speaking to Journalists shortly after the NEC meeting, the party's National Chairman, Chief John Oyegun said the party was excited over the level of interest generated by those wishing to compete for APC presidential ticket. “As far as the party is concerned, the more, the merrier because they help in the process of membership mobilisation, particularly when they are from different parts of the country. And we have not put any geographical barriers as to who becomes our presidential candidate. We hope to seize the political space when the candidates come out and this will happen almost weakly from now," he said. On whether the APC may consider adopting a zoning arrangement, Oyegun said the party was seeking for the best candidate and as such has decided to throw the contest open to all contenders from any parts of country. He said it was left for Nigerians to decide where their votes will go during the next year's general election. "No, we are not zoning; we want the best to come from every part of the country. The person who puts food on your table is your brother while the person who is depriving you of food, you will not just say because he is your brother that you will keep voting for him," he said. The chairman also said the party was set for the Adamawa by-election, except for the legal tussle going on brought up by the sacked deputy governor who is laying claim to the right to occupy the governorship. Jibrin opined that instead of the former Head of State heeding the persuasion of his supporters to seek the presidential ticket of the All Progressives Congress (APC), he should cede the turf to a host of worthy successors like the incumbent governors of Rivers, Chibuike Rotimi Amaechi; Edo, Adams Oshiomhole; Lagos, Babatunde Fashola; Imo, Rochas Okorocha and Kano, Rabiu Musa Kwankwaso. "I believe that we have to be honest with ourselves on the issue of Buhari’s's aspiration to be president. Perhaps, that has been the challenge of the North. I have an inner conviction about what I am saying. "My message to him is that he should play that tape of 2011 where he said he won't contest again...so, the issue of his supporters bringing him back does not arise," Jibrin said.